Fruit Cake fans (you know who you are), this month’s for you. 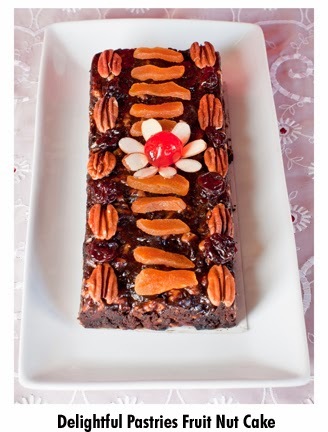 December is National Fruit Cake Month. 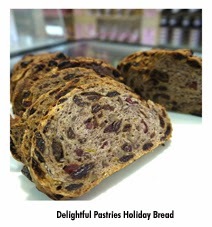 Delightful Pastries offers delicious variations including its holiday breads. Throw away any of your pre-conceived notions. Most ethnic groups have their favorite recipe for fruit and nut bread and Delightful Pastries’ modern take is as refreshing as it is delicious. Try something new this year, like: Stollen ($20). 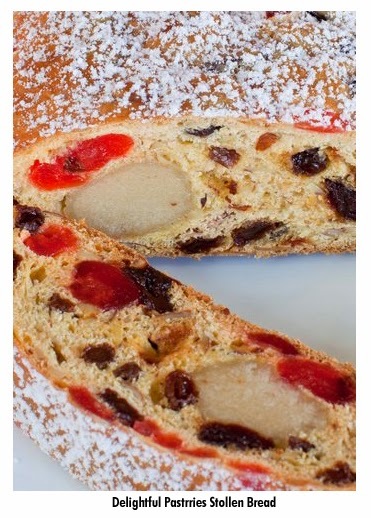 A traditional German stollen includes candied orange peel, raisins, almonds and is ¬filled with marzipan. 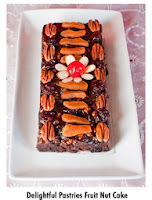 The English prefer a traditional fruit cake and Delightful Pastries gives it a modern twist, Cognac Fruit Cake ($20), which is soaked in Cognac and Grand Marnier, which makes the taste of all the fruit and nuts come alive. Another modern twist on a traditional, Royal Gingerbread ($14) is filled with hazelnuts, almonds, walnuts, raisins and candied orange peel; the entire bread is dipped in chocolate. Holiday breads also make awesome French toast for Christmas or New Year’s breakfast. Fruit cakes and fruit breads are available at all three Delightful Pastries location: 5927 W. Lawrence Avenue, Chicago, in the Jefferson Park neighborhood (phone: 773-545-7215). Store hours are Tuesday-Friday from 6:30 a.m. to 6 p.m., Saturday from 6:30 a.m. to 5 p.m. and Sunday from 8 a.m. to 1 p.m.; closed on Monday. The Old Town Chicago location, which includes the Café, is at 1710 N. Wells St., just north of North Avenue (phone: 312-255-0724). Store hours are Monday-Saturday from 8 a.m. to 6 p.m. and Sunday from 9 a.m. to 5 p.m. The Chicago French Market location is at 131 N. Clinton Ave., Chicago (phone: 312-234-9644). Store hours are Monday-Friday from 7 a.m. to 7 p.m. and Saturday from 9 a.m. to 5 p.m.; closed on Sundays. Mousse is a French word that literally means "froth" or "foam," in reference to the dish's light, airy texture. Leave it to the French to perfect this pillowy dessert, created by folding in beaten egg whites or whipped cream. Chocolate mousse was a specialty in French restaurants during the 1800s. You can thank The Joy of Cooking for the popularity of chocolate mousse. When it was first published in 1931, this iconic cookbook included an excellent chocolate mousse recipe. Delightful Pastries chefs pay homage to mousse in a variety of its dishes including a Passion Fruit Mousse Cake, Raspberry Chocolate Mousse Cake, Raspberry Almond Torte, Black Forest Torte, Berry Compote with chocolate mousse, Chocolate Tulip with Crème Mousseline topped with fresh berries, Lemon Mousse Cup with blackberries, and Raspberry Mousse with Berry Compote. Whichever one you choose, these are the perfect finale to a terrific meal. 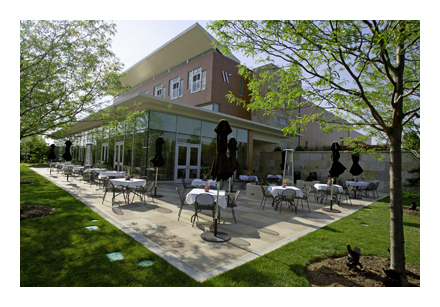 Celebrating its second anniversary, Waterleaf restaurant (425 Fawell Blvd., Glen Ellyn, IL 60137; telephone 630-942-6881), is a dream come to fruition for College of DuPage. "What we've been able to do, in two short years, is to establish Waterleaf as a stellar example of modern fine dining," says Jean-Pierre Leroux, general manager. "It is truly a wonderful restaurant. I am proud it has become not only a favored dining spot for food lovers in our area, but also an example of how excellent a restaurant can be when given proper attention and a focus on detail throughout." Waterleaf is the brainchild of COD President Dr. Robert L. Breuder and Leroux, the longtime owner-operator of the celebrated Barrington Country Bistro in Barrington, Ill. While some may question why a community college would build such a modern restaurant, the answer is apparent for those who know Dr. Breuder and College of DuPage. "We wanted to set the stage for our students, their parents, guests and the community," Dr. Breuder said. 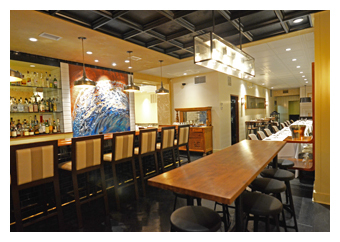 "Having a professionally run, modern restaurant on campus is a bold statement. We want Waterleaf to reflect today's fine dining style, which is more casual and relaxed in tone, but still high in quality. We are serious about our academic programs and strive to convey that in every aspect of our campus life." Waterleaf's mission is to be an inspiration to the culinary students in the College's growing Culinary and Hospitality Management program. Unlike other culinary schools, however, Waterleaf is run by professional chefs with opportunities for student engagement. The Waterleaf team includes Executive Chef Nadia Tilkian, whose professional experience includes stints at Barrington Country Bistro and the highly regarded Maijean, which she owned in Clarendon Hills. Leroux's résumé includes a stellar career in some of the finest restaurants and hotels in Europe and the United States. "We are committed to offering our guests the most hospitable and delicious dining adventure possible," Leroux emphasizes. "Waterleaf continues to evolve. Not willing to rest on our laurels, we are mindful of the need to set even higher standards while remaining in step with the desires of our guests." Since its opening in 2011, Waterleaf has received a three-star review by Crain's Chicago Business and a Readers' Choice Award for Best Restaurant for Dinner from Glancer Magazine. Waterleaf also is recognized for its stellar wine list, receiving Wine Spectator's coveted Award of Excellence for 2012 and 2013. This award, given annually to restaurants in the United States and 65 countries worldwide, acknowledges that Waterleaf's wine program is consistent with its dining concept, style and price point. Waterleaf is also a recipient of the Diner's Choice Awards for Best Ambience, Best Overall, Best Service, Fit for Foodies and Special Occasion on OpenTable.com, where it maintains a 4.8/5.0 rating. Overlooking a scenic lake, the restaurant's floor-to-ceiling windows and outdoor seating area provide a naturally beautiful ambiance. "We've been blessed with a wonderful location and a mission to be one of the Chicago area's best contemporary restaurants," said Leroux. 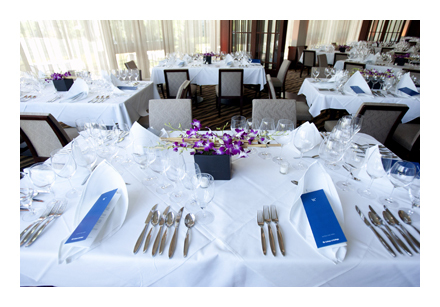 "Waterleaf strives to be sophisticated yet relaxed. We think of it as modern fine dining, where the focus is on great food and service offered with a down-to-earth, informal vibe - the way people like to eat today." With comfortable seating and a natural color scheme, this "hidden gem's" warm atmosphere lends itself to dinnertime respites, business lunches and everything in between. 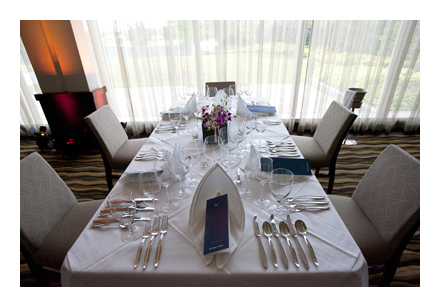 Waterleaf's semi-private room is perfect for social occasions or business events. 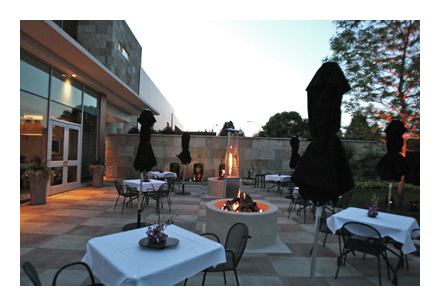 Outside the main dining room, the patio features outdoor seating and propane heaters to keep guests warm and comfortable in the autumn and early spring. Executive Chef Nadia Tilkian, who joined the staff in February, has recently introduced new menus for this fall, keeping with the more casual dining mood of today's guests. These offerings embody modern contemporary American cuisine at its finest. Tilkian astutely combines her beloved French technique with modern American food sensibility, offering guests rich flavors and textures from around the globe. 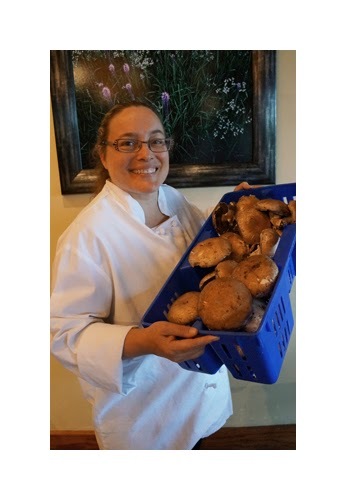 She is passionate about using top quality, locally sourced ingredients. "Those familiar with my cooking style understand my love of country French cuisine. While I do incorporate those ideas into the Waterleaf menu, here I am focused more on American cuisine and the many ways American chefs are bringing great ideas from many food cultures into their dishes," Tilkian said. "As a role model for culinary students, Waterleaf has a responsibility to showcase culinary ideas that expand students' creativity while giving them an appreciation for great technique." Selections from the current fall dinner menu (the menu will change throughout the season) include appetizers such as Tempura Shrimp with coconut rice spring roll and spiced butternut squash broth ($12); Sweetbreads with persimmon-Meyer lemon chutney and petit herb salad ($14); and Crab Ragout with Alaskan king crab, leeks, radish and mirin broth (photo left; $15). Signature soups and salads on the dinner menu include Chef Tilkian's French Onion Soup with garlic crouton and Gruyère cheese ($8), and a delicious Lyonnaise Salad with baby frisée, potatoes, poached egg, crouton, bacon and sherry vinaigrette (photo right; $9). Fall entrées include Bass with frog leg-white bean fricassee and kale ($28); Filet with purple fingerlings, bone marrow and mustard sauce (photo below left; $36); Porchetta with Brussels sprouts leaves, preserved apples and pork glace (photo below right; $26); and Duck Leg Confit with kumquat tart and cocoa nib reduction ($28). 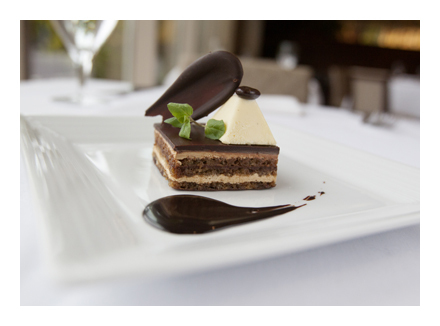 Desserts for fall include the luscious Pumpkin-Caramel Mousse Cake with ginger snaps ($9); Opera Cake with espresso buttercream and white pepper ice cream (photo below left; $9); and Coffee Panna Cotta with chocolate gelée, malted crunch and cocoa nib tuile ($8). "We're not trying to be kitschy or avant garde about our menu," Tilkian said. "We're simply offering guests the opportunity to enjoy well prepared and handsomely presented dishes in an accessible, relaxed manner. We think we've succeeded in making it easy to have a very comfortable experience at Waterleaf. We try to be surprising in an understated way by offering guests a high level of culinary creativity accompanied with excellent service. We give our guests very pleasant, eye opening experiences that keep them coming back." Area business people often seek out a quieter and more refined restaurant at lunch time for discussing business matters or holding celebrations. Waterleaf, with its lake view, does a splendid job of filling this niche. Lunchtime menu items offer elegantly prepared dishes starting with appetizers, soups and salads and continue with sandwiches, entrees, vegetarian options and desserts. Lunch is served Wednesday through Friday from 11:30 a.m. to 2 p.m. and Saturday from 11:30 a.m. to 2:30 p.m. Weekend brunch service offers a tranquil, comforting break and Waterleaf's many fans realize brunch is a perfect way to unwind while savoring excellently prepared food and the gorgeous view. With a full a la carte brunch menu, guests can select from traditional breakfast favorites or lunch inspired entrées. Brunch is served Sundays from 11 a.m. to 2:30 p.m.
Waterleaf restaurant's excellent wine service, coupled with globally-influenced contemporary American cuisine, is rapidly cementing the fine dining restaurant's reputation as a top DuPage County dining destination. 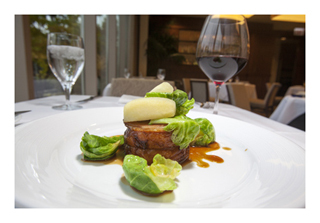 Recipient of Wine Spectator magazine's prestigious Award of Excellence in both 2012 and 2013, Waterleaf's wine program features extensive offerings that express the restaurant's philosophy and cuisine. "Our wine selections offer a wide variety of choices, both domestic and international, that are excellent accompaniments to our food and offer real value for our guests," said Jean-Pierre Leroux, Waterleaf's general manager. Updated regularly, Waterleaf's wine list features exceptional, yet reasonably priced wines from around the globe. International offerings include: Varichon & Clerc Brut NV, Rhone Valley, France; Prendo (Pino Grigio) from Vigneti Delle Dolomiti, Italy; 2010 Steenberg, South Africa and 2009 F. Weins-Prum (Reisling), Wehlener Sonnenuhr Kabinett, Mosel Valley, Germany. Domestic favorites include: 2009 Darioush, Russian River Valley, California; 2009 Chappellet, Pritchard Hill, Napa Valley, California; 2007 Miner Family Winery, The Oracle, Napa Valley, California; and the 2009 Sequoia Grove Winery, Napa Valley, California. The collection also includes a global collection of after dinner dessert wines and Portos. While the collection will certainly grow over time, Leroux stressed that the emphasis remains on moderate pricing. "So far, we have succeeded in keeping wine prices down, but the wine quality very high," he said. "We want ensure an excellent wine can be enjoyed by everyone who desires the Waterleaf experience." 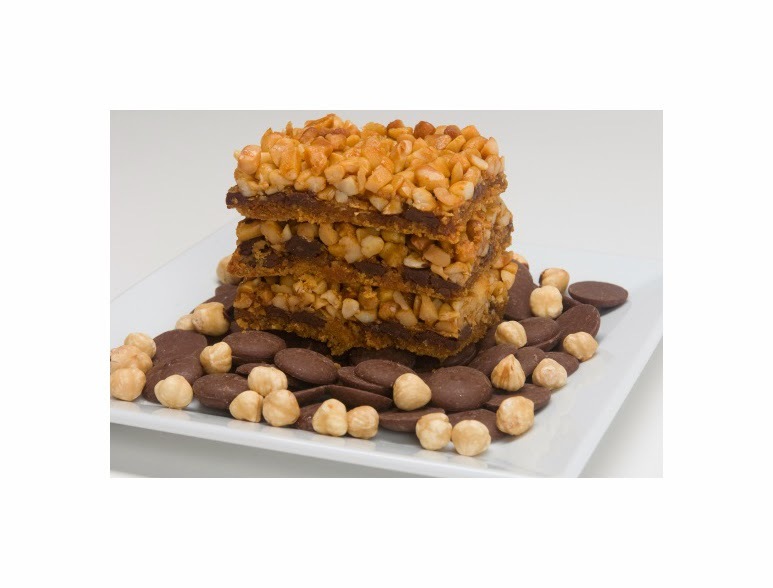 November 22 is earmarked as National Cashew Day and we can’t think of a better way to celebrate than by chowing down on a sinful Delightful Pastries Congo Bar. Start with a base of Graham Cracker crumbs topped with bittersweet chocolate, homemade caramel, coconut, macadamia nuts and cashews, it doesn’t get any better than this. It’s a bargain indulgence at $3.50 per bar. Come to Chicago French Market's Marche de Noel for your holiday shopping! The Marché de Noel is a holiday feature of the Chicago French Market. Nineteen rotating visiting artisans selling unique gift items will display and sell their wares daily from 8 a.m. to 6:30 p.m. through December 20. 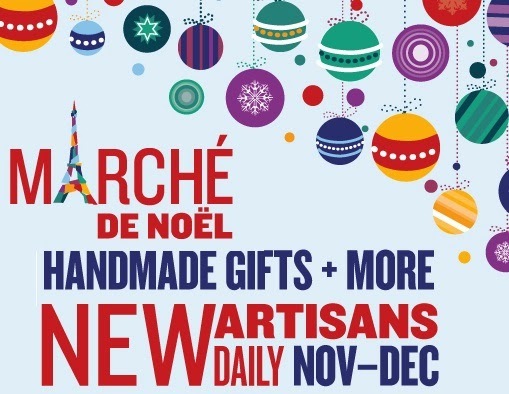 Modeled after French Christmas markets, Marché de Noel provides a fantastic atmosphere and unique shopping options, not to mention the opportunity to find those gifts for everyone on your list. The Marché de Noel at the Chicago French Market also offers shoppers the opportunity to do all their holiday shopping in one location. Artists will sell jewelry, kids' items, wall decor, photographs, toys and many more gift options. A variety of new items will be featured at the Chicago French Market during this time as well. The Marché de Noel is believed to have begun in Dresden, Germany in 1434 under the reign of Fredrick II of Saxony. The Marché de Noel first began in France in the city of Strasbourg where it is still held today. It has continued ever since in France and in many other cities throughout Europe. Beaujolais Nouveau Wine Tasting - 4:30 to 6:30 p.m. The annual release of Beaujolais Nouveau is truly an international event. Celebrate this year's arrival with Pastoral during a complimentary tasting from 4:30 p.m. to 6:30 p.m. Thursday, November 21. Be sure to ask your Pastoral cheese monger to recommend some cheese and salami to accompany this year's unique batch! Beaujolais Nouveau - 1 to 2:30 p.m. 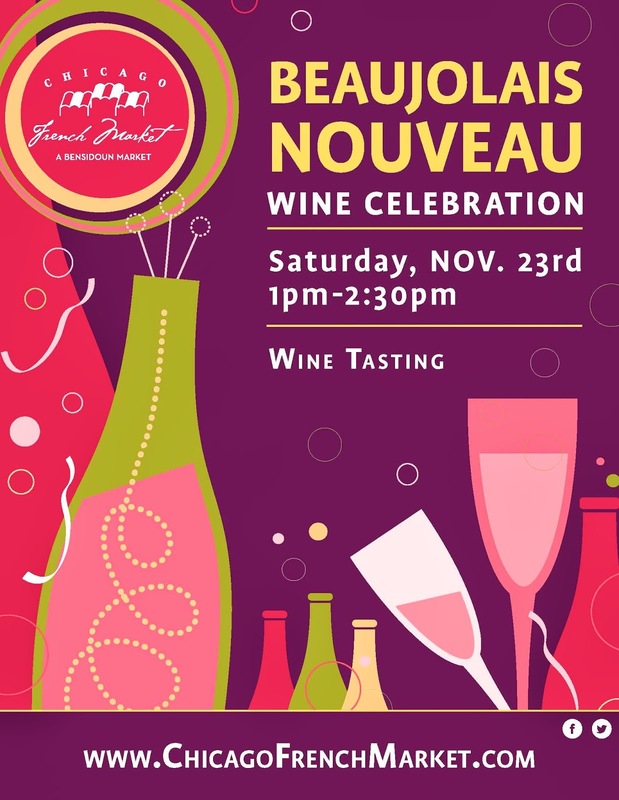 It's time to celebrate the Beaujolais Nouveau at The Chicago French Market! This French tradition begins at midnight on the third Thursday in November. You are invited to taste this young wine from the fields in France: Beaujolais Nouveau. The grapes used for this wine were on the vine in August, picked in September, in the barrel in October and in the bottle in November. 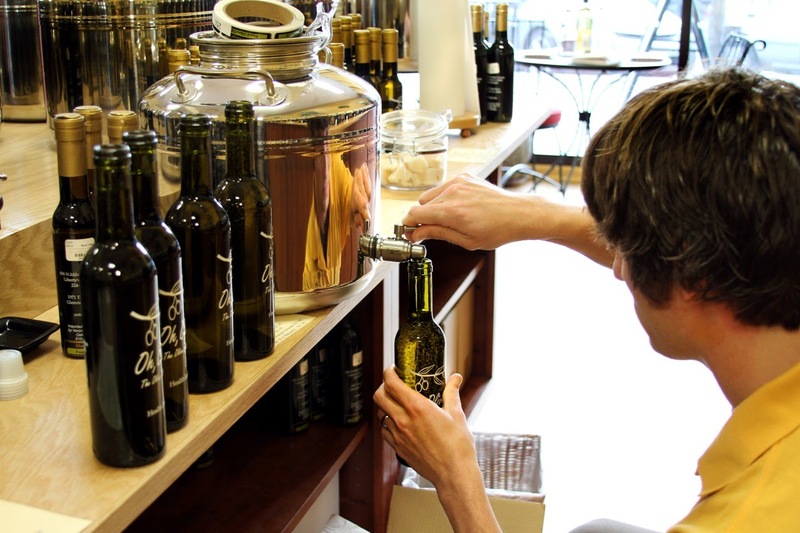 While you taste this young wine, stroll through the market and experience 32 unique vendors specialties. 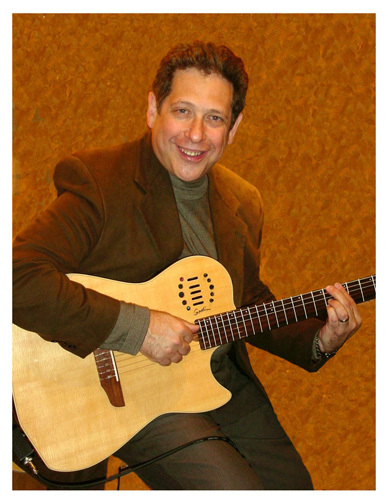 Enjoy Lunch Hour Music with Steve Justman at the Chicago French Market today! Folk musician Steve Justman joins the lunchtime crowds from 11 a.m. to 2 p.m. November 20. Justman has been performing Americana, folk, and popular music in the Chicago area and the neighboring Midwest region for many years. He is a collector of songs as well as other artifacts of Americana. Influenced by entertainers of all types, Steve showcases his collection of songs in his performances, singing and interpreting a mix of traditional and popular folk, pop standards, and classic country that people might know while focusing on connecting with his audience and pure entertainment. He has performed and appeared live on WGN radio on Rick Kogan's Sunday Papers show as well as WDCB Public Radio's Folk Fest with Lilli Kuzma. He also has appeared on Internet and college radio stations as well as local cable television. Chicago French Market is excited for his return. Sam's Gourmet Lasagna introduces its new lasagna, Steak & Potato Lasagna. 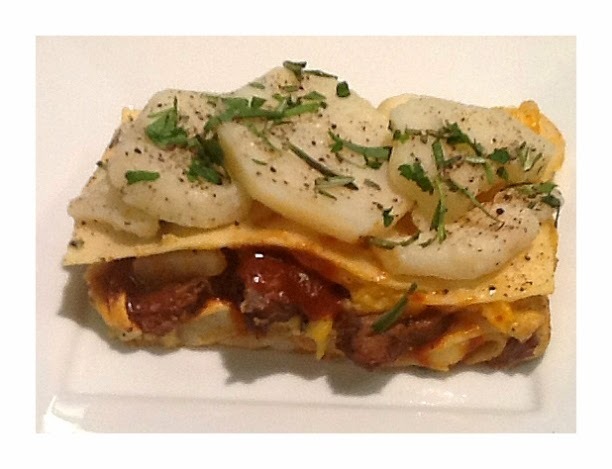 The Steak & Potato Lasagna will be featured on November 13 with sample tastings and packaged "to go" for breakfast, lunch or dinner. November is a great time to place orders for lasagna and pasta for corporate events, family gatherings and more with Sam's Gourmet Lasagna & Pasta for the holiday season. This month's featured gourmet lasagnas and pastas include: Mande's Mac N Cheese; Lasagna selections - Ground Turkey, Vegetable, Chicken, and Sausage. Deadline for placing holiday orders is Friday, November 22. Sam's Gourmet Lasagna offers daily Hot Grab n Go Specials. Purchase hot, out the oven (Ground Turkey, Sausage, Vegetable, or Chicken) lasagna for original price and a second lasagna costs just $5. Barrie's idea for a "virtual band project, in which he plays solo over his pre-recorded jazz backing tracks, evolved naturally. Having taken a break from professional performances for a number of years, he became a self-taught jazz pianist, which gave him the technical and musical skills to arrange and record his own instrumental backing tracks at his home recording studio. A lunch hour featuring the live music of Lee Alec Barrie, 11 a.m. to 2 p.m. Saturday, November 16 is sure to be an energizing and memorable experience. Labels: "Chicago French Market", "Chicago Jazz Guitarist", "Chicago music", "Got Buzz", "Kurman Communications", "Larry Carlton", "Lee Alec Barrie", "Lee Barrie"
Oceanique Restaurant (505 Main Street, Evanston, Ill.; 847-864-3435) will celebrate the arrival of Beaujolais Nouveau wines with a special Harvest Celebration dinner on Friday, November 22, 2013. 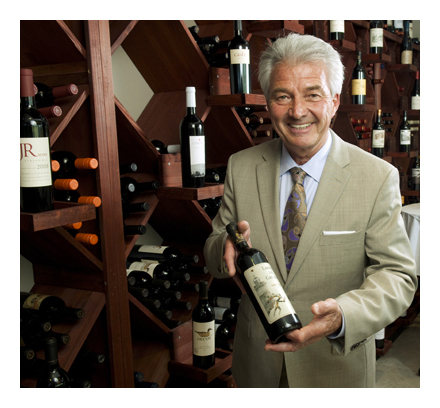 The dinner will be hosted by Jean Jacques Fertal of Eagle Eye Imports with Chicago Gourmets. 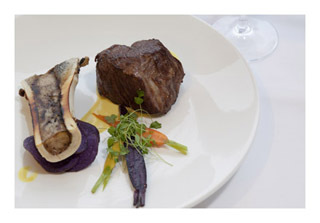 The five-course menu, with wine pairings is priced at $95 per person, including tax and gratuity. The evening begins with a Beaujolais Nouveau reception at 6:30 p.m., followed by dinner at 7 p.m.
Oceanique has been acknowledged for its exceptional wine service, having earned the Wine Spectator "Best of" Award of Excellence as offering one of the top 750 wine lists in the world. The release of Beaujolais Nouveau is an annual milestone for those wine lovers who look forward to their first taste of these young, fruity Beaujolais wines that are perfect accompaniments to the foods of autumn. 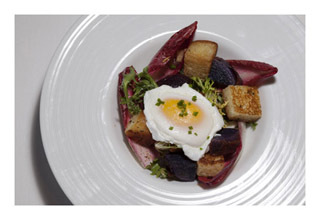 "We like to have fun with the Beaujolais Nouveau wines each year," said Chef Mark Grosz. "Our Beaujolais Nouveau wine dinner is meant to be amusing and relaxed, reflecting the joyous character of these wines. It's always a hit with our guests and this year, we again expect a fun-loving crowd of food lovers." The dinner begins with a Beaujolais Nouveau reception, followed by the five-course dinner. 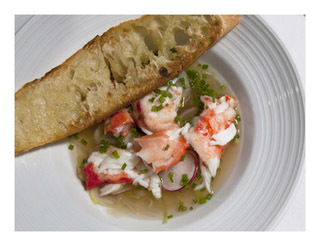 The first course features Chilled Lobster Consommé, paired with 2012 Antonin Rodet Macon Villages. The second course is Chicken Liver Mousse with Madiera Jelly and Pôilane, paired with 2012 Domaine des Préaux Saint-Amour. Indiana Quail with Apricot, Chanterelles and Belgian Endive comprises the third course, paired with 2012 Domaine de la Voie Romaine Morgon. Passion Fruit Sorbet serves as a refreshing Intermezzo and the dessert course features Local French Cheeses served with Fig Compote and Plum Mostarda and paired with 2011 Domaine Benoit Raclet Moulin a Vent. For more information on Oceanique's Beaujolais Nouveau Wine Dinner, or to make reservations, please contact Oceanique at (847) 864-3435 or visit the website at www.oceanique.com. They would be lying if they said they weren't thinking about wine all the time. So it's no surprise that they've been thinking about their favorite Thanksgiving wine pairings since last year! Stop by Pastoral throughout the month of November to get a wine recommendation or sample some of Pastoral's Benchmark Wine selections during the week leading up to Thanksgiving. They'll help you find the right bottle for dinner, desert, or for gifts. Pastoral's 2013-14 Gift Catalog is now available! Whether you're thanking a client for their business, sending a gift to a far-away loved one, or bringing a hostess gift to dinner, Pastoral has your gifting needs covered. Stop by the store for a copy of our new catalog today! Orders can be placed in-store, online or by phone. Local delivery and nationwide shipping is available! Pastoral Artisan has locations in the city as well as a vendor booth at Chicago French Market (131 N. Clinton St., Chicago IL, 60661; 312-575-0306). There are countless ways to enjoy celebrating Thanksgiving in Chicago. Whether dining in or out, these restaurants and businesses are offering specials that will make it easy to entertain. Bring home delicious, homemade pies from Delightful Pastries for all to enjoy this Thanksgiving. Whatever is your fancy, Delightful Pastries’ new expanded pie menu will have something to suit your taste. 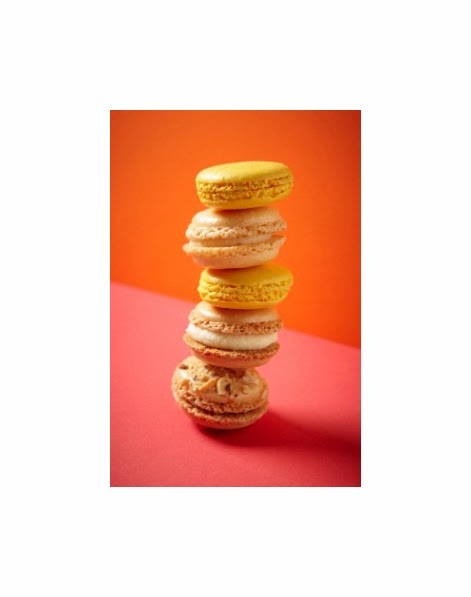 Included are traditional selections like Apple Pie, Pumpkin Pie and Pecan Pie and the not so traditional Apple Caramel, Cranberry Fudge, Coconut Chocolate, and Bourbon Chocolate Pecan. 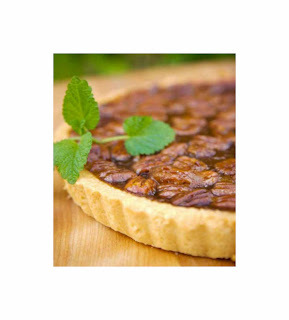 All pies ($25) serve 8-10 people; are made from scratch and use no artificial flavors or preservatives. For those entertaining for the weekend, pick up a breakfast/brunch savory pie such as the Spinach Lamb ($58), Veggie Quiche ($42), or Ham Quiche ($42). Other items on Delightful Pastries’ to go catering menu include: winter and grain salads, mini-pastry trays, international cookie trays and brownie trays. Pre-orders are recommended and package pricing is available. Orders may be placed at all three Delightful Pastries locations: 5927 W. Lawrence Avenue, in the Jefferson Park neighborhood (phone: 773-545-7215); the Old Town Chicago location at 1710 N. Wells St., just north of North Avenue (phone: 312-255-0724) and the Chicago French Market location at 131 N. Clinton Ave. (phone: 312-234-9644). November starts the holiday season and entertaining is on everyone’s mind. Delightful Pastries makes it easy, with an array of international cookies, all holiday favorites from around the globe. Available are Cucidati (Sicilian Fig Cookies), Viennese Almond Crescents, Mexican Wedding Cookies, Polish Kolaczki (Raspberry, Apricot, Cheese), Christmas Mice, Rugula, Linzer and Italian Rainbow Cookies ($19/lb. or by platter, $20-$30). French Macarons ($30 lb.) and Chanukah Macaroons ($1.75 each) also are available. The East Bank Club is hosting Thanksgiving dinner at its place this year and you’re invited. The East Bank Club’s signature restaurant, Maxwell’s at the Club (500 N. Kingsbury St., Chicago), is offering a traditional turkey dinner buffet with all the trimmings, 1 p.m. to 7 p.m., November 28. Executive chef Mike Lodes is featuring a variety of appetizer and salad , a carving station with Roast Turkey served with gravy and natural jus, Roast Prime Rib of Beef with horseradish sauce, and Roast Leg of Lamb with mint jelly, and an abundance of side options. To finish off, guests will be treated to an impressive spread of seasonal fruits, assorted cakes, tortes, cookies, and cupcakes, and pies. The price is $45 for adults, $15 for children 10 and under. 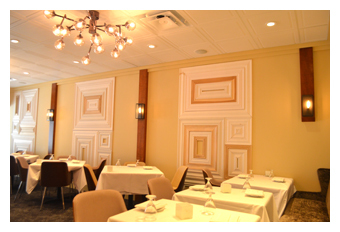 Reservations can be placed online at maxwellsattheclub.com or by calling (312)527-5800 ext. 301. If you plan to entertain at home this Thanksgiving, East Bank’s Food Shop will be delighted to do the cooking. The Chefs at the Food Shop have put together a complete Thanksgiving menu to suit a variety of tastes. You have the choice of ordering a la carte from their entire menu or selecting the Thanksgiving Package. With the latter option the Food Shop chefs have curated their version of an ideal holiday meal. For the complete Thanksgiving menu visit eastbankclub.com, and to place your order call (312) 527 5800 ext. 318. 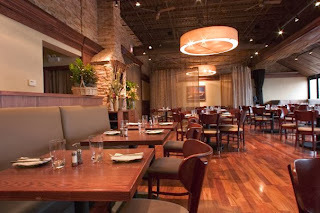 Northbrook’s Prairie Grass Cafe (601 Skokie Blvd. ; 847-205-4433) chefs Sarah Stegner and George Bumbaris want to make your Thanksgiving dinner perfect and easy. The two award winning chefs have announced their “Thanksgiving To Go 2013” menu available for pre-order now. All orders must be received no later than Sunday, November 24 for pickup at the restaurant on Thursday, November 28 between noon and 3 p.m. The à la carte menu includes everything you would want for the perfect Thanksgiving celebration. Start with a whole Roasted Turkey and Gravy, serving between 10 and 14 people for $110 or half a turkey to serve between 5 and 7 people for $60. Homemade Apple Sage Stuffing ($14/quart) and Homemade Sausage and Giblet Stuffing ($24/quart) are available by the quart, serving between 4 and 6 people. A variety of homemade appetizers include Butternut Squash Soup (Serves 4/$20/quart), Organic Mixed Green Salad with Shaved Parmesan, Pumpkin Seeds and Pomegranate (Serves 6-8/$45); Jumbo Cocktail Shrimp with Homemade Horseradish Sauce ($42/dozen); cut vegetable assortment with Amish blue cheese dip (Serves 6-8/$35); or Smoked Salmon Platter with Cream Cheese, Cucumbers, Capers and Red Onions with Pumpernickel and Whole Grain Baguettes (serves 6-8/$65). Side dishes include Yukon Gold Mashed Potatoes (pint/2-3 servings/$7; quart/4-6 servings/$14); Sweet Potato Puree (pint/2-3 servings/$8; quart/4-6 servings/$16); Sautéed Green Beans (pint/2-3 servings/$8; quart/4-6 servings/$16); Brussels Sprouts with Bacon and Chestnuts (pint/2-3 servings/$12; quart/4-6 servings/$24); and Local Cranberry Sauce (pint/2-5 servings/$8; quart/6-10 servings/$16). A Prairie Grass Cafe Thanksgiving wouldn’t be complete without Mom’s Homemade Heirloom Pumpkin Pie ($24/pie/6 slices); Mom’s Pecan Pie ($24/pie/6 slices) or Double Chocolate Cake ($50/cake/10-12 servings). Not in the mood to entertain at home? Prairie Grass Cafe will be serving a Traditional Thanksgiving Dinner, 2:30 p.m. to 7 p.m., Thursday, November 28. The cost of $49 per person includes a choice of Butternut Squash Soup or Organic Mixed Green Salad with Pumpkin Seeds, Parmesan, Pomegranate and Balsamic Dressing; Oven Roasted Turkey with Mashed Potatoes and Homemade Gravy; Apple Chestnut Stuffing; Sweet Potato and Butternut Squash with Homemade Marshmallow Topping; fresh vegetable; local cranberry sauce, and choice of Mom’s Heirloom Pumpkin Pie, Pecan Pie or Double Chocolate Cake. Reservations are required. Whether it’s a hostess gift, cooking supplies or a meal to go, the Chicago French Market provides opportunities for Thanksgiving shopping under one roof. 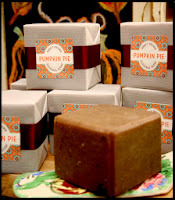 Abby Brown Artisan Soaps is featuring its ever popular Pumpkin Bars this month. A perfect hostess gift for Thanksgiving and the holidays at only $8.50 per bar, Abbey Brown Soap Artisan creates handmade natural Olive Oil soaps, soothing body oils and relaxing bathing essentials. They make all of their fine products in house, infusing homegrown herbs and botanicals with pure essential oils. Picking out the perfect wine to pair with Thanksgiving dinner or to bring as a gift is difficult if you’re not wine knowledgeable. When seeking expert advice, look no further than Pastoral Artisan Cheese, Bread and Wine at Chicago French Market. Pastoral is the perfect shop to learn more and receive expert help in choosing the perfect wine. 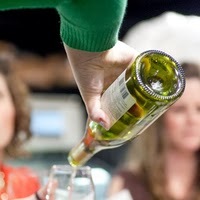 Staff is trained to know wine and how to pair to complement foods. Stop by Pastoral for advice throughout November. Stop at Oh Olive! at the French Market and sample its delicious Wild Mushroom and Sage extra virgin olive oil. It’s a perfect enhancement for drizzling over turkey before roasting or for using it to make delicious and unique rye bread turkey dressing. Not everyone serves a traditional turkey for Thanksgiving, according to the folks at Sam’s Gourmet Lasagna. Sam’s offers a delicious ground turkey lasagna and has introduced a Steak & Potato Lasagna just in time for the holidays. They have upped their to go pre-packaged offerings for holiday gift, entertaining and corporate events.